Glowforge is starting to ship some versions of its 3D laser printer, but it’s still unclear if the company will meet its previously-promised delivery date for all customers. “We’ll exchange these units for production units later,” he added. The key question for many customers is when the production units will actually arrive at their doorstep. 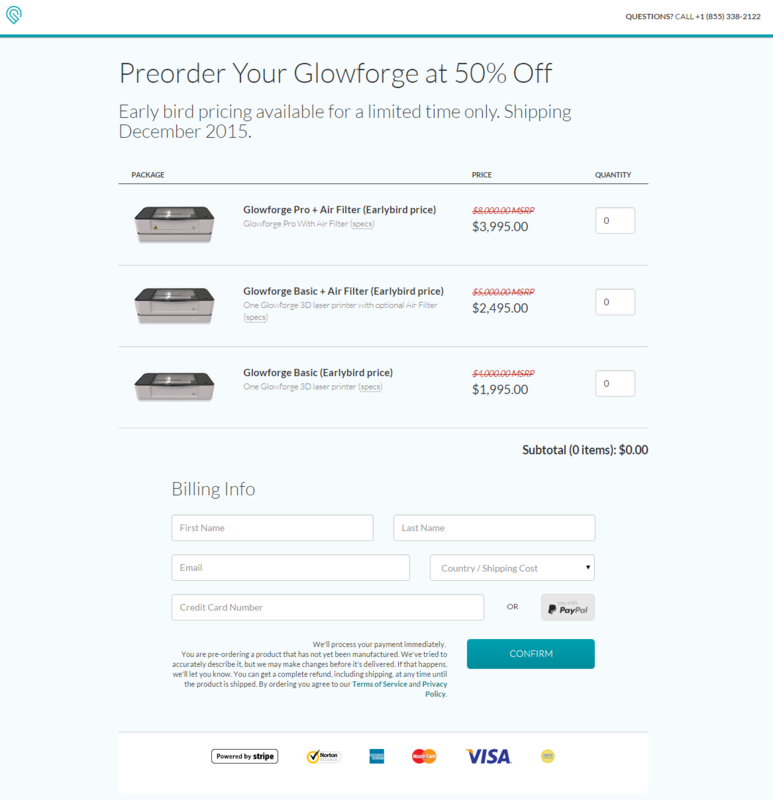 Glowforge set a crowdfunding record last year by raising nearly $28 million from thousands of backers who pre-ordered its innovative 3D laser printer in October 2015. The printer uses a laser to quickly cut and engrave products and lets people use raw materials like leather, paper, plastic, fabric, or cardboard and make items with a push of a button. The company’s original plan was to start shipping the “first units” in December 2015, two months after the crowdfunding campaign ended. But in February, Glowforge said those shipments were delayed, telling the initial backers who pre-ordered during the 30-day campaign that they’d now receive their printers in June. Then, this past April, Glowforge again delayed shipments due to power supply issues and pushed the delivery date back to December 2016. It said those who ordered after the 30-day crowdfunding campaign would receive their printers in March 2017. It’s not clear if all units ordered during the crowdfunding campaign will ship to customers by the end of next month. Shapiro said he’ll provide an update on the company’s shipping schedule for “production units” — not the “pre-release units” — next week. Most of the early responses to the company’s latest update seem positive. In September, Glowforge announced that it reached $45 million in sales. The printer retails at $2,995 for the basic model and runs up to $5,995 for a premium version. Those prices were discounted heavily during the crowdfunding campaign. This past August, Glowforge raised a $22 million funding round from Foundry Group and True Ventures, pushing total funding to $31 million. The 42-person company was founded in 2014 by Shapiro, who created the popular kids board game Robot Turtles — one of Kickstarter’s most successful campaigns ever — and fellow Seattle area startup veterans Tony Wright and Mark Gosselin. Glowforge on Wednesday also revealed its U.S-based manufacturer: Flex. The publicly-traded company, which posted $6 billion in revenue last quarter and employs 200,000 people across 30 countries, is manufacturing the Glowforge printer in Milpitas, Calif.
Shapiro said that a decade ago, he met one of the co-founders of Coffee Equipment Company, a Seattle-based company that developed the Clover brewing system and was later acquired by Starbucks. Shapiro recently met up with the co-founder again and learned about how the startup worked with Flex. “He made introductions, and after evaluating many different suppliers around the world, decided that Flex could build the very best product for our customers,” Shapiro said. I wish everyone had their Glowforge already. We come into our office every day and print with these amazing machines every day, for both work and for play. But we’re late in delivering them to you, the people who made it possible. That’s not fair. We feel terrible about it. I wish I could give you a shipping date and time to the minute, guaranteed. But the only way I could do that is if I decided we were willing to ignore problems to hit a deadline. Please know that we are doing everything possible to deliver the best product we can, as soon as we can. I regularly sign 5- and 6-digit checks for rush orders that are solely intended to accelerate the delivery of your product. As you know, we decided to pay a premium to assemble your Glowforge unit in an American factory, in no small part to avoid the 30 days of ocean and customs time we would otherwise have before delivering. We’re working long, late hours. We’re doing everything possible. The only thing we’re not doing is compromising on the product. I know you’ve waited patiently. It’s been a year since we first showed Glowforge to the world, and four months since we hoped to have it on your door, every day of which we feel painfully and personally. Should you want to give up, we’ll understand completely and, of course, issue a full refund immediately. Should you decide to stick it through with us, though – we can’t wait to get you your Glowforge.